Samsung discontinues Galaxy S in India to make way for Nexus S? One of the most popular Android smartphones in India, the Samsung Galaxy S, has been discontinued according to multiple dealers. We checked in Delhi and multiple dealers claim that the phone is out of stock and Samsung has discontinued the product. We have been able to confirm through secondary sources that a similar situation exists in Bangalore. Coming back to the Galaxy S story in India, could it be that Samsung is now preparing to launch the Nexus S in India? We know for sure that Samsung has plans to launch the Nexus S in India but not even in our wildest dreams did we imagine that it could be this early. Before some of our “admirers” jump the gun and call this story fake, we are not making any claims when Samsung would launch the Nexus S over here. We are just trying to put things into perspective and giving a likely possible scenario. Our hat tip to our good ol’ friend Tushar for sharing the situation in Bangalore. Don’t forget to share with us in the comments if your friendly neighbourhood cellphone retailer is also claiming that the Galaxy S has been discontinued. Following up on our earlier post about Motorola’s plans to launch the Milestone X in India, we have been hit with some more information. It is not the Milestone X but something even bigger and is in fact a global announcement. Again this is unconfirmed, but it seems that Motorola will announce an Internet Tablet with a 10-inch display this month. The timing sounds just about right with Google’s Gingerbread announcement any day now. Could it be that it ain’t the Nexus S alone and there is a Moto tablet waiting to share the limelight? We certainly think so. Is this the Google Nexus 2 aka Samsung Nexus S? There have been rumors about another Google Nexus Android smartphone and this time it would probably involve Samsung. Well, the eagle eyes at Engadget have spotted a picture of what could be the Nexus 2 or what could eventually be called the Nexus S (Nexus One+Galaxy S, geddit?). The screenshot on the device does indicate it could be running Gingerbread or Android 2.3 and there certainly is a video calling camera. If this indeed is the next Nexus, we would be betting our chips on a November announcement, just in time before the Christmas shopping season begins. While we wait for the announcement, how about guessing what would be the specs on this beast? Let us know in the comments below. 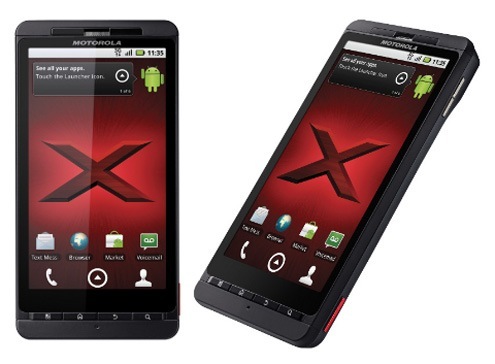 The Milestone X/Droid X/Motoroi X has a 4.3-inch display, runs on Android 2.2 and has an 8.0 MP camera with 720p video recording. It has 8 GB of internal memory and a 1 GHz processor. Mind you, we have not been able to confirm the launch yet. Expect a confirmation coming your way pretty soon. Apple is in talks with Tata Indicom and RCom to offer the CDMA iPhone in India, according to a report in the Wall Street Journal. The report goes on to mention that Tata has been talking to Apple for four to five months. The news come amid reports that Apple will launch a CDMA iPhone with Verizon Wireless in the US, marking the end of AT&T’s exclusivity contract that began in 2007 when the first iPhone was launched. Even if the CDMA iPhone is launched in India, it is very unlikely to sell in any significant numbers. Both Tata Indicom and RCom have been unsuccessful in selling high-end smartphones. Considering that a CDMA version of the iPhone will be more expensive than its GSM variant and carriers do not offer subsidies on phones in India, the CDMA iPhone will find even fewer customers than the GSM version. Even today, the grey market for iPhone has sold more numbers than Airtel and Vodafone, the two carriers that have the rights to sell the smartphone in India. Another hurdle for the two CDMA carriers would be the absence of high value subscribers on their networks. When RCom launched its CDMA services in India, it was portrayed as a ‘poor man’s’ network with cheap tariffs (their punchline – now calling is cheaper than sending a post card). Some might argue that mobile number portability, which is set to kick in at the end of October, might help but still the high price of the CDMA iPhone will be a major deterrent.